Well today finds us still on a free Aire in the town of La Chambre which lies in the Maurienne Valley, and we stayed here specifically so we could have a ride up the Col du Glandon which is a climb of nearly 14 miles + 2 more to get from T4rdis2 to it's base. At an altitude of 1924 metres it's not quite as tall as the Col Du Galibier (2646 metres), but the height gain is slightly more - 1475 metres as opposed to 1216! Anyway, all that's a bit irrelevant cos we didn't quite make it to the top cos both ourselves and our bike batteries were ready to conk out about 4 miles short of it! And it was probably a good job we stopped when we did because, up until that point the gradient had been 7 & 8%, but this 'hill' is said to have some of the steepest pitches in the whole of the Alps and near the top it ramps up to 10, 12 and 13% 😨. This is another climb that has been regularly used in The Tour de France, but we knew we'd missed the thrills of that by several months. 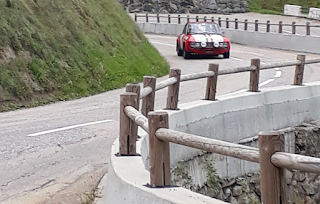 However, excitement was provided today by us landing slap in the middle of one of the stages of The Trophee des Alpes Rally - a 4 day event that covers 1,600 kilometres over some of the highest Massifs in the range. We'd only just started our ascent when the first of over 100 cars started to zoom up behind and race past us, and they were all Classic cars which included Porche's, Lancia's, MGB's, Volvo's (like the Saint used to drive), Beetles and quite a few others that I didn't recognise! Our other purpose for riding up this Col was to suss out if the road would be suitable to take T4rdis2 over for our ongoing journey. To start with the road was very good, but as we got to it's upper steeper slopes it became narrower, and once again only nearly wide enough for 2 cars (but definitely not wide enough for 2 big vehicles) However, when a full size coach came hurtling towards us that seemed to confirm that we possibly could manage it - and later when John checked the map and realised we'd have nearly 60 miles further to go if we don't go over the top of the Col - that clinched his decision! So in tomorrows story I'll let you know how we got on 😨😨! Oh, and I nearly forgot about the Beaufort Cheese! I went and purchased a small amount from the nearby Fromage Co-operative and we had it as a snack following today's little jaunt - Delicious! Well, on Thursday morning we made a bit of a sensible decision! 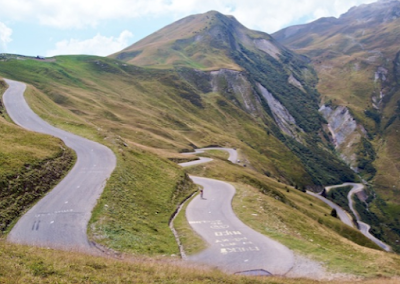 I told John I was really quite worried about going over the top of The Col de Glandon because of the narrowness of the roads near it's summit - and he took hardly any persuading to agree with me! So our minds were soon made up to go the the long way - and in the end it was a very good job because the weather was absolutely atrocious with strong winds and driving rain that left lots of debris on the road even at low levels, so goodness knows what it would have been like at 1,924 metres which is the summit level! So with the aid of Mrs Snoopy (who got her knickers in a twist to start with and tried to send us on the toll road), we started off on the D29, then the D523 and then the A41 towards Grenoble, and after that we found ourselves on the D1091 which runs through the very beautiful Romanche Valley which is one of 6 valleys in the Oisans Mountain Region. This Region covers a huge area of the Alps, and within it's boundaries the mighty mountain ranges of Belledonne, Taillefer, Grandes Rousses and Ecrins can be found. 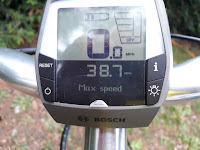 Specifically, we were heading for Bourg d'Oisans which is the main town in the region, and one from where we would be able to ride up Alpe d'Huez. John hadn't been able to find an Aire in this area, but as our laundry bags were once again bulging we settled for an ACSI campsite that had washing machines, and it was right at the foot of the little hill we were planning to climb! This town was also the one we'd been heading for a couple of days ago when we got as far as the settlement of La Grave - from there we'd had to do a huge detour to the north around the Grandes Rousses Massif because of a collapsed tunnel on the banks of Lake Chambon! We arrived in the early afternoon, but as the rain was still bouncing down we just settled in and put our feet up for the rest of the day, but while we were doing that a bit more route planning took place. Friday morning saw us up and getting ready to nip to the top of Alpe d'Huez - a 9 mile climb with 21 hairpin bends resulting in an average gradient of 8% and a height gain of 1150 metres to it's summit which sits at 1850 metres! This hill is probably one of the most well known climbs in The Tour de France, and even today, when the peak biking season is more or less over, it was still very popular with cyclists of lots of different abilities - it has to be said it was mostly Lycra clad men on road bikes but we did see a few mountain bikes going up, and we even got a wave from another couple on E-bikes similar to ours. We later learnt that on average 400 people make this climb every day in the summer! The climbing started right from the gate of our campsite so there was no time to warm our legs up - therefore, 'Tour mode' was quickly adopted and we were soon passing bend 21 - bend 1 is at the top! Each bend has a signpost which names a Tour winner along with the year of his victory, so reading these, along with admiring the magnificent views distracted us from the hard work of cycling! I suppose some people might say going up on an E-bike is cheating, but there is no way I'd have made it to the top without the aid of my battery - so for me it was the only way - and I wouldn't have missed it for the world. When we got to the top we entered the busy ski village that today was a mecca for cyclists, and it was here that we were able to stand on a podium as proof of our achievement - 2 Cols conquered and 1 failure so far but I think John's got a few more rides up his sleeve yet so hopefully our number of victories will improve! Oh, and did I mention the cold, you might find yourself sweating when going up but it's bloody freezing when your zooming down! Well Saturday was a bit of a 'dull day' in the lives of the T4rdis2 travellers - even though the sun was shining for most of it! So why was it dull? Well tackling the huge washing pile that was taking over the interior of our ship could not be put off any longer - and I Hate wash day cos something nearly always goes wrong😦! Anyway, the job had to be done so I gathered all our laundry together and managed to stuff most of it into 2 10 kg machines - and it washed well - but came out almost dripping! And then the bloody dryer didn't work despite the fact that it ate my money! Therefore it was a very good job the sun was shining because T4rdis2's interior and exterior once again became festooned with washing that took until well into the afternoon before we could abandon it! So by that time it was a bit to late to cycle so we satisfied ourselves with an exploratory walk into the town of Bourg d'Oisans and a 🍷🍷🍷🍷🍷 and black gold raid on the local Casino supermarket - (we picked up 4 litres of wine and 5 litres of 🛢oil 🛢so hopefully we wont be in the same situation as we were back in Les Verney's! Therefore, as I say, a bit of a Dull day where we didn't do much at all! However, Sunday was much better - the weather forecast was good for most of the day 🌞😎🌞 so we decided to stay put in this lovely area and do a bit more cyclo exploring. 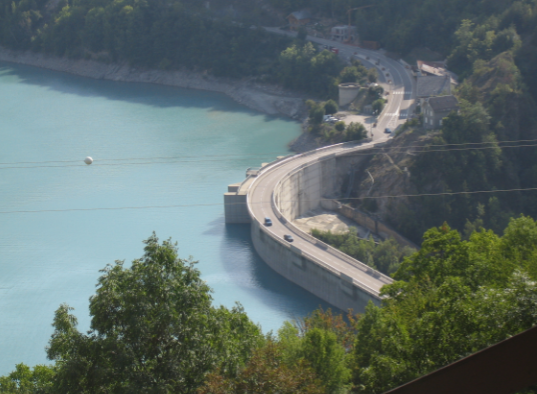 John planned a route that would take us to the barrage of Lake Chambon - another man made lake that provides hydroelectricity to thousands of households. Apparently this lake is one of the largest in the area and is the result of the damming of the River Creuse - and at the height of summer it is a mecca for swimmers kayakers and sailors, but today it's waters were still and deserted, and absolutely stunning as they disappeared off between the mountains. But I haven't told you about how we got to the lake - and that was a bit of an adventure in itself! We left T4rdis2 and started our journey by re-climbing the first 5 hairpins of Alp d'Huez - and as we rose up it's slopes my impression was that someone had made them steeper than on Friday 😨 - therefore, I was more than glad we weren't going right to the top on this occasion! At bend 16 we left the Col and headed off towards the hamlet of Auris en Oisans, and although we continued to climb the gradient eventually became more gentle as we headed towards one of the main features of this route. A bit of an understatement! It's called Route de la Roche, and the guide book describes it as 'vertiginous' because it is literally carved out of the cliff face at a great height! As we rode along the route the mountain reared up on our left, and the shear drop on our right allowed us to view the Bourg d'Oisans plain where the river Romanche spreads out ! The pictures below really don't do it justice - it was absolutely magnificent! And from there we didn't have much further to go before most of our climbing for the day was done - but this had definitely been the best part of our ride. We found the lake and it's huge dam after about 10 miles - just perfect timing for our lunch break, and after we'd been fed and watered we didn't linger to long before we were on the homeward dogleg of our 'circular' ride, which even though it took us along a main road, was still quite spectacular! Do you think it looks like a Dog Leg? 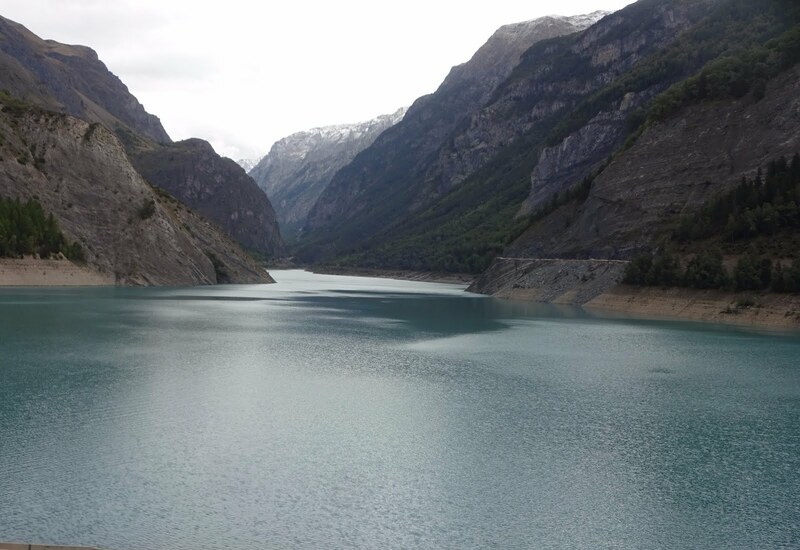 On this part of our journey we found ourselves riding along the D1091 which passes through lots of tunnels and also part of the Romanche Valley, so once again we had tall cliffs towering over us and numerous waterfalls to glegg at as we went. And even though rain was threatening a bit by then we still stopped once more to sip coffee and admire the vistas!